"I've got this great idea for a comic book..."
You've heard it before. Maybe you've even said it yourself. But has the thought of actually converting your concept into an actual comic book you can hold in your hands scared you off? Well, allow us to demystify the process—from concept to script, with two of the top pros in the industry at the help. We know what you've been wondering. What do I need to shop a comic idea—a script? Artwork? How many pages? What format? Where do I send it? If it gets accepted—how do I write the script? Alex is the author of the Pete Fernandez crime novels, and has also written a number of comic books, including the best-selling and critically acclaimed Archie Meets Kiss storyline, which USA Today called "a thoroughly entertaining (and wonderfully bizarre) story", as well as the “Occupy Riverdale” story, as well as Archie Meets Ramones. And taking you from idea to first issue script, is Eisner- and Bram Stoker-nominated comics writer Alex de Campi. Alex brings her years of experience of comics writing, plus lecturing on the art of comics writing at SVA and Writers Digest, to take your project from good to amazing. Vulture said about her recent noir Bad Girls (with Victor Santos, from Gallery Books / Simon & Schuster) that "de Campi and Santos are near absurdly good at depicting sexiness in word and form", and Publishers Weekly called her writing "masterful". She's also published everything from horror (Grindhouse at Dark Horse, and Archie vs Predator), teen survival thrillers (No Mercy, Image Comics), superheroes (Sensation Comics feat. Wonder Woman), and love (Twisted Romance, Image Comics). She specializes in tight, thrilling, page-turning stories that have an intensely cinematic feel. Basically, if you ever thought about getting into comic books—this is going to give you the ground game to do it right. Each week will include assignments, to be critiqued by your instructors, and opportunities for Q&A along the way. More and more, editors expect you to have a first issue ready, and sample art drawn. Can't do that without a script. 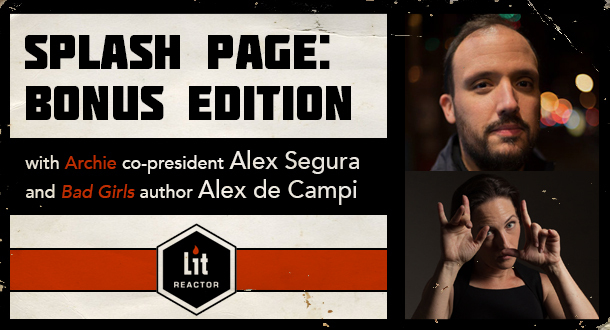 Alex de Campi will teach you the elements of what goes into a script and help you get to work on writing your first issue! You wrote a script. It's a thing. It exists. Now, armed with feedback from de Campi, you can elevate it from a stack of printed pages to a really strong, unique piece of work. You'll also overview how to find and work with artists. Alex Segura will give you the tools to make your daydream get a step closer to reality. You'll write a sample pitch based on these discussions and he'll give you feedback. WEEK 4 - What now? You've got a pitch, what do you do with it? Segura will give you general guidelines on dealing with editors—including over email, at shows—as well as insider tips on what they look for. The class will conclude with a review of your revised pitch based on Segura's notes.